Get your women and children off the street. This may cause a riot. I’m not sure just why I would attempt a rating of this kind. It’s a no-win situation from the outset. Every collector will come up with a different list of their twelve most popular patterns, and some of these people can be dangerous when it comes to their favorites. In my own defense let me say I did consult with a number of knowledgeable collectors–well at least several–well actually three and then came up with a composite for purposes of this report. Our biggest problem was defining “popular.” We concluded that it involved a great many factors including beauty, availability, number of colors and shapes found in that pattern, prices paid at auction and in many cases the publicity a pattern has had. Good press goes a long way in shaping collectors’ opinions. In any event here is the final list in the order of popularity. Let me also add that this article is being written in April 1989. It will be at least a couple of years before it appears in print. Carnival patterns are faddish and popularity can shift almost overnight. 1. POPPY SHOW – ROSE SHOW (Northwood?) 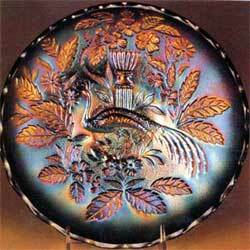 – The art glass of the Carnival world. It’s almost impossible to separate these two patterns so they have been combined. 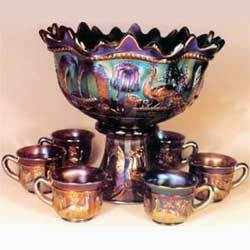 They are so exquisite that they are given top billing even though limited in shape to just bowls and plates. This is offset in large measure by the multitude of colors in which it was made. They are assumed to be Northwood, but this has never been confirmed. 2. PEACOCK ON THE FENCE (Northwood) – It’s hard to find anyone who doesn’t like this pattern. 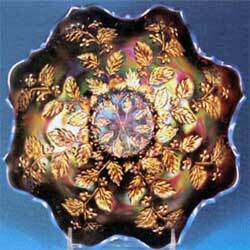 Here again it is found only in bowls and plates, but the beauty of the pattern and wide range of colors demands that it be given this number two spot. 3. GRAPE AND CABLE (Northwood) – The most famous and well recognized pattern in all of Carnival. No doubt there is more Grape and Cable out there than any other pattern and in the widest of colors and shapes. I’ll be heavily criticized for not putting it in the number one spot. In the last several years, however, this pattern, except for the pastels, has lost much of its previous popularity and appeal. 4. GOOD LUCK (Northwood) – All collectors relate to this pattern and much of its popularity is due to this familiarity. Here again the shapes are limited. 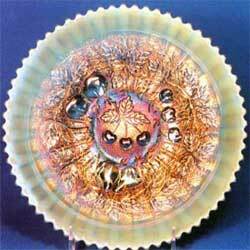 It is found on stippled and non-stippled bowls and plates in a wide spectrum of colors. I’ve never met a Good Luck I didn’t like. 5. ACORN AND BURRS (Northwood) – Produced in a wide range of colors and shapes. It is hard not to rank it higher once you have seen the nine magnificent colors in which the punch set alone can be found. 6. 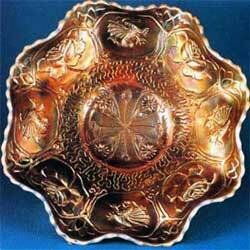 DRAGON AND LOTUS (Fenton) – Collections have been built on this single pattern. 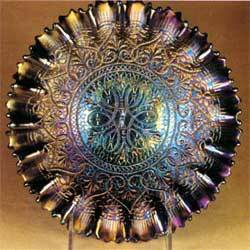 While limited to both footed and collar base plates and bowls, few patterns are found in a wider range of colors. That is its strength along with its availability and the uniqueness of the pattern itself. 7. HEARTS AND FLOWERS (Northwood) – This is a pattern that has come on like gang busters over the past few years. Its strength is due in large measure to the wide range of available colors in which these bowls, plates, and compotes are found. 8. 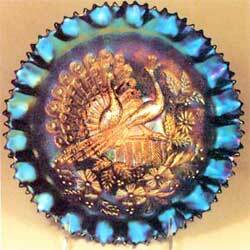 PEACOCK AT THE FOUNTAIN (Northwood) – This pattern has a lot going for it and I wish there was more room at the top of this list. It is a great pattern that comes in a wide range of colors and shapes. 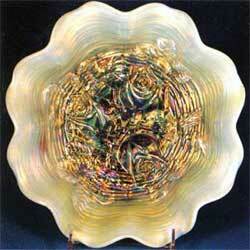 If it came in a 9” bowl and plate, which is a popular shape at the moment, it would have to be moved up. 9. THREE FRUITS (Northwood) – In spite of its limited shapes, it is a beautiful pattern that is available in many colors. It is helped by the three types of bowls in which it was made–color base, dome base, and spatula footed. Collectors relate to this pattern and it is available. 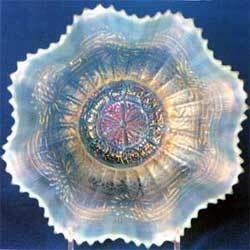 Nothing is much prettier than an aqua opal Three Fruits plate. 10. 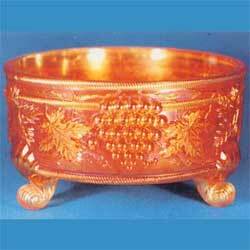 NORTHWOOD PEACOCK AND URN – The ice cream bowl set is the basic shape in which this is found. A few of the master ice creams were flattened into chop plates and two or three little plates are also known. These were flattened from the individual bowls. None of the shapes in this pattern are easily found. This ranking is dictated by the elegance of the pattern and the colors in which it is found. 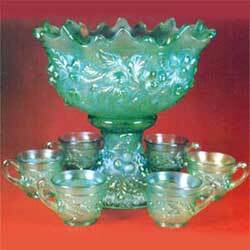 The aqua opal master ice cream bowl has to be one of the most beautiful pieces in Carnival. 11. HOLLY (Fenton) – This is one of the more available patterns and most collectors relate to it. This, plus the impressive list of colors in which it is found, demands that it be a part of the top twelve, even though limited in its range of shapes. 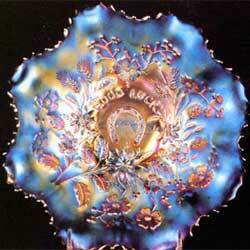 It received further attention when a celeste blue plate sold at auction in 1988 for $9,500. 12. EMBROIDERED MUMS (Northwood) – This pattern is not readily available and it is found in a limited number of shapes. It is one of those patterns, however, that has caught the attention of collectors the last few years. Even though it is a beautiful pattern and was made in many exotic colors, it would not have made the top twelve a few years ago. It is a pattern whose time has come. Our current love affair with the pattern was bolstered when bowls in seven different colors sold at the 1989 Britt auction for from $1,000 to $2,700. Well that’s it. Don’t try to find me. I’m joining the Foreign Legion for a few years.